Description: Easter Egg Hunts for the kids, games, prizes, a raffle, face painting, and food concessions, among other fun activities. Visitors will also get to see the big cats “hunt” for their Easter Eggs! No strollers, please. Description: Enjoy a family fun day at the Ranch. Games, crafts, visits with the Ranch animals, and an Egg Hunt with the Easter Bunny. Description: Join us for the annual Easter Egg Hunt, rain or shine. Bring kids of all ages to participate in the egg hunt on the North Lawn and enjoy other fun activities. Egg hunt is for ages 5th grade and younger. Event will be inside if it rains. To help supply eggs for all participants, please drop off candy at church in the foyer. Look for the collection basket at the Welcome Desk. 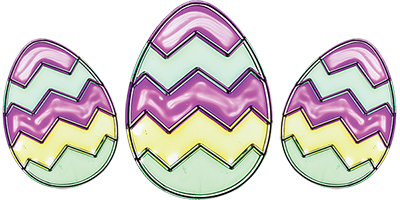 Description: Find 5 eggs & return them to the registration desk for candy! Description: The City of Irving offers area families a fun, free experience with the Citywide Egg Hunt! Take part in egg hunts for children ages 3-10, with thousands of toy-filled and candy-filled eggs, as well as a petting zoo and craft activities. Bring a camera to take a free photo with the Easter Bunny. Snacks and beverages will be available for purchase. It is recommended to arrive at least 15 minutes prior to the listed egg hunt time for your child's age group, as all hunts will start on-time. Adults are not permitted to assist children in the egg hunts, and are encouraged to watch and enjoy from the viewing areas alongside the egg hunt field. Children ages 1-2 years who are able to walk independently may take part in the Egg Stroll. This is a special area dedicated to our youngest participants, which allows them to hunt for eggs at their own pace. The Egg Stroll will be open from 10 to 11 a.m. Each child may be accompanied by up to 2 adults; children ages 3 and older may not enter the Egg Stroll area. Description: Grab your Easter basket and hippity-hop over to Pecan Grove Park to hunt for over 20,000 treat-filled Easter eggs. At this free event you will enjoy face painting, bounce houses, photos with the Easter Bunny and much more! Egg hunts are categorized by age groups and are scheduled at various times throughout the event. In the case of inclement weather, the event will be held on Saturday, April 15th. Description: Hop on over to Central Park for a chance to hunt for colorful candy and toy filled eggs. There will even be a few special prize eggs with tickets for prizes. Activities include bounce houses, face painting, pictures with the Easter Bunny for $2 per picture, and snacks for sale. No registration required. Description: Bring your Easter baskets, and join us for the Easter Eggstravaganza where there will be more than 80,000 Easter eggs up for grabs! Children with special needs are invited to join the hunt on field #11. Enjoy bounce houses, face painting, photos with the Easter bunny and other activities. Description: Come experience Easter in true Texas style! Easter egg hunt for all ages begins at noon sharp, and afterwards there will be an Easter bunny, face painting, a balloon animal maker and more. Description: Make it a full day in the garden and head over to the Camp Lawn for an Eggstravagansa. Enjoy live music on the Martin Rutchik Concert Stage & Lawn, and enjoy garden games and activities for all ages including face painting, sack races, and live bunnies. You really can't beat the food at this place; they have the best vegetarian meals and the most adorable dishes for the kids. The service at LA event venues was impeccable. The salad I had for dinner was delicious as well as the scallop appetizer. The main course of filet mignon and dessert soufflé was also awesome!